This virtual meeting place provides members of MLP Clergy Support Network with the opportunity for professional networking and collaboration. This virtual meeting place provides members of MLP Elders and Deacons Support Network with the opportunity for professional networking and collaboration. This virtual meeting place is for Presbyterian parents and families building a church and community where our lesbian, gay, bisexual, transgender and queer children are embraced and loved unconditionally. This is a virtual meeting place for LGBT seminary students preparing for ministry in the Presbyterian Church (USA). This Facebook Group is managed by Presbyterian Welcome and you can request access by contacting Mieke Vandersall at mieke@presbyterianwelcome.org. A welcoming ministry of outreach, fellowship, education, and advocacy among the Presbyterian Church (USA) for gay, lesbian, bisexual, transgender and queer people of faith! LGBTQ and allied Presbyterian youth and young adults between ages 14 and 35 are invited to share issues of concern to them. This private, invitation only, discussion list is intended to provide sanctuary and safe space. Please respect the persons and information shared here. 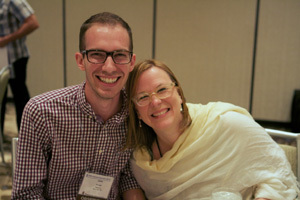 The board of More Light Presbyterians has initiated this private discussion list to enable liaisons of partner organizations involved in the More Light movement within the Presbyterian Church (USA) to share joys and concerns, and possibilities for ministries with one another in a safe space. If you would like to participate in this group, please contact antony@mlp.org. MLP brings together blog posts from across the More Light Movement. If you want to include your blog, please complete our online application.